Welcome to Holiday Headquarters and my Scandinavian Summer feature at Skimbaco Lifestyle! Holiday Headquarters is a collaboration between several lifestyle, decorating and party experts and we are happy to participate in this summer party special today. 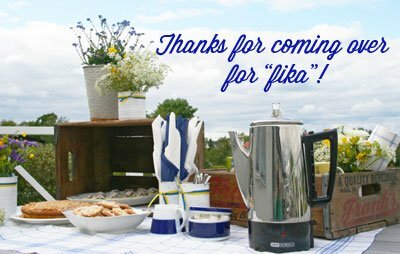 I’m inviting you over for “fika in the backyard” – fika is a Swedish word for a coffee break. 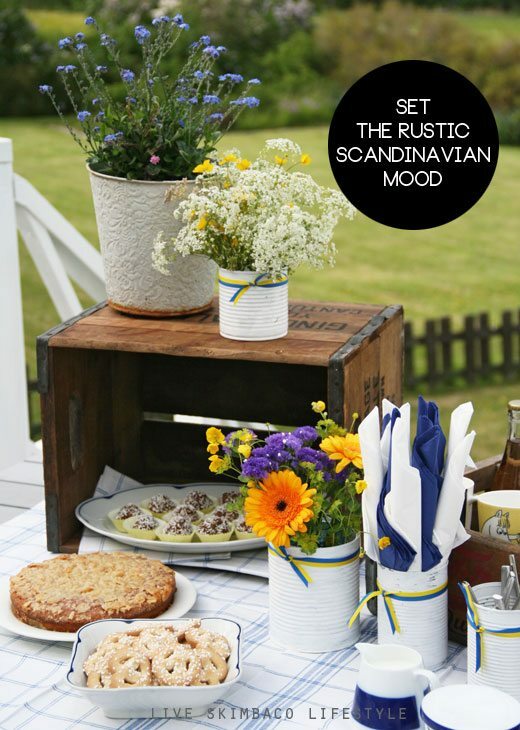 Get some coffee, sit back and learn how to host a summer party the Scandinavian way. Make sure to subscribe to our feed to get more ideas like this delivered to you. 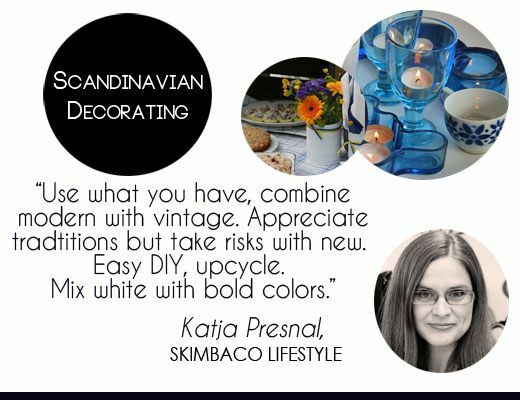 Skimbaco Lifestyle is all about Scandinavian-inspired living, and many of the ideas that actually come from Scandinavian home decorating apply to other aspects in life too – or other way around. Same way as using what you have in home decorating applies to life – make the best with what you already have. Combining traditional with modern is also an important aspect of Scandinavian lifestyle – and home decorating. There are hundreds of years of heritage and history that still is seen in everyday living in Sweden, Finland, Denmark and Norway, yet Scandinavia is the mecca for modern design and modern technology. Strong contrasts can be seen everywhere, from weather to design: cold dark winters veiled with white snow contrast with warm colorful summers with never ending sunshine letting the gardens bloom in bold colors, and all of this inspires art and design. Scandinavian decorating style has always included combining very rustic elements and natural materials with sleek modern design, and it is trendier than ever – everywhere in the world. When it comes to summer entertaining the Scandinavian way, there is one word that describes it better than anything else: EASY. Since you want to spend most of your time outside enjoying the summer, the party decorating and cooking is all very simple. 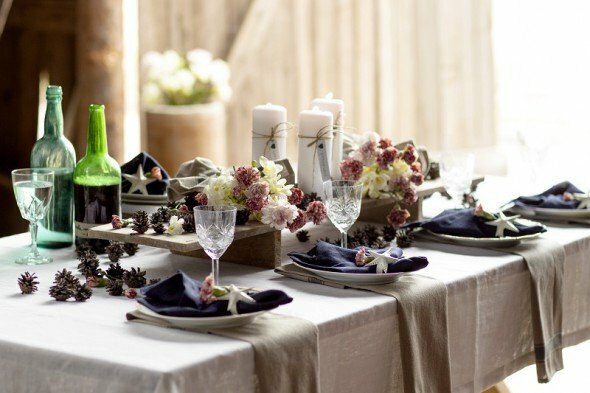 Use what you have, make crafts like the soup can vases, which you can even make outdoors, pick flowers from your own garden or from a nature walk, and enjoy fresh fruit and vegetables straight from garden or farmer’s market in your menu – the point is: enjoy the process of creating the party as much as hosting it. Create a menu that you can make ahead of the time – or whip up quickly by the BBQ grill. Enlist kids to help and make it a family effort. My daughter’s specialty is Swedish chocolate balls, and my 9-year old son knows how to make Finnish summer berry pie and loves it with blueberries. The night before the party I boil extra potatoes and throw a huge salmon file on the grill and enjoy the night with my family (this makes a great party dinner menu too – if you are having a dinner party). The next day I make a potato salad with radishes, and salmon wraps (recipe coming this summer) for the party. Easy, since the cooking was already done. And while Scandinavian summers are more than pickeled herring, typically there is some sort of seafood in Scandinavian parties. Try the easy Danish Smorrebrod, an open shrimp sandwich, make it smaller as an appetizer, or larger for lunch menus. 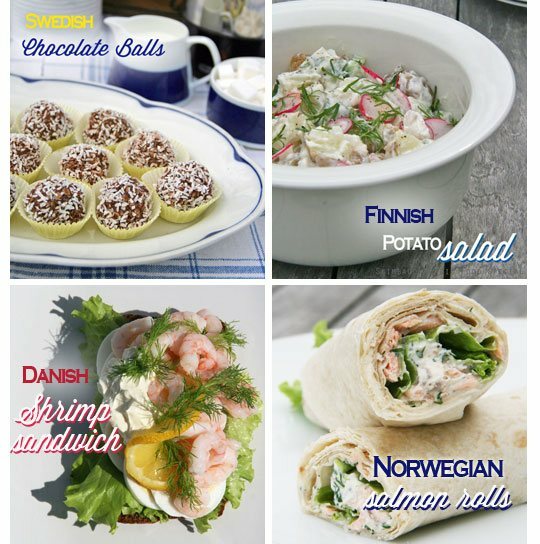 Taste of Scandinavia – and super easy. One key element to Scandinavian lifestyle is sustainable living. When it comes to decorating this means upcycling old things to something new, using flea market finds, and purchasing quality that lasts for years to come. And above anything else: avoiding waste by any cause. That also means avoiding paper plates, anything disposable, using the cheap dollar store decorating items that you can only use once. I cheat on one thing – sometimes I use paper napkins, like I did in our “Fika Party in the Yard”. 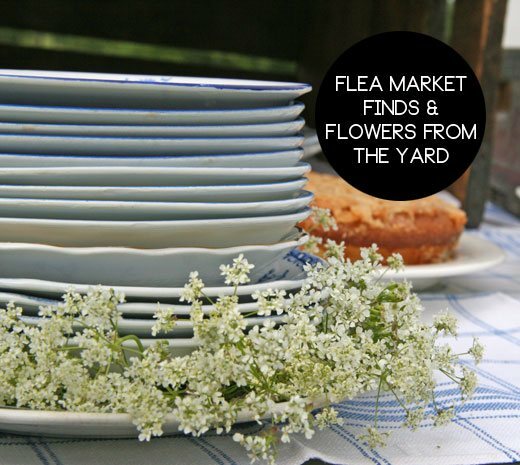 The mix match flea market plates look great as a collection and when you match them with simple modern dinnerware – it all sort of goes together very well. Use natural materials like linen and cotton, when it comes to picking the textiles. I used vintage kitchen towels as a table runner, and get the details how to recreate this above rustic dinner party and read the tips from a Scandinavian interior design store owner. I told you that traditions play a big role in Nordic countries. 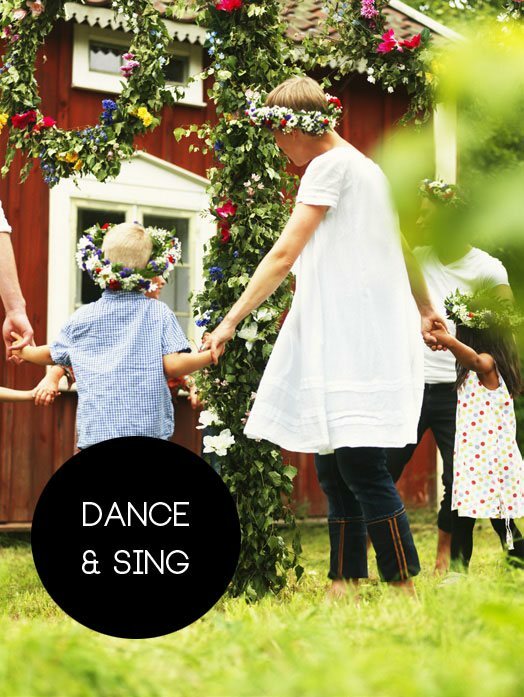 Well, singing and dancing is part of that, and when summer comes – the somewhat reserved Nordic people start singing and dancing. Often fueled a little with vodka, beer or wine, or all of it. And often outdoors where there is space to dance, and the singing echos in the lakes. Swedish have drinking songs that are not just for college students, but what they sing even during fancier dinner parties. It’s normal to sing and then drink, Swedes prefer Aquavit, and Finns drink vodka. While singing songs in the dinner table or around a pole decorated with flowers in the yard might not be for you – why not add a backyard karaoke and add some funky music to your party and get people dancing (don’t forget adding ABBA to the playlist!). I just want to know where my invitation is. right here. come on over. Great post. Sorry I missed the Twitter party. Little late reading, and had the kids alone tonight. Finally got everyone in bed. Have a wonderful vacation. What time should I pop over? These are great ideas for summer entertaining that isn’t your everyday hot dogs and burgers. This is a stunning post!! I love everything…dancing and singing, mix of plates, and styles…the soup can vases painted white are adorable…and the food looks DIVINE!! I love this post and I wish we could be at this party together! Okay, I think I may be Scandinavian. LOVED every aspect of the Scandinavian summer. Especially the “easy” party ….. oh and the dancing & drinking ;). Chat with you tonight at #HolidayHQ! That was a from-the-heart compliment. I wasn’t trying to be nice. I was amazed. I can see the effort, the thought and the time you put into this. It’s amazing. Seriously. I am really impressed. I hope Martha, Rachel and the best of them see how amazing this is. Katja, I loved having “virtual” coffee with you – can’t wait to do it in person! 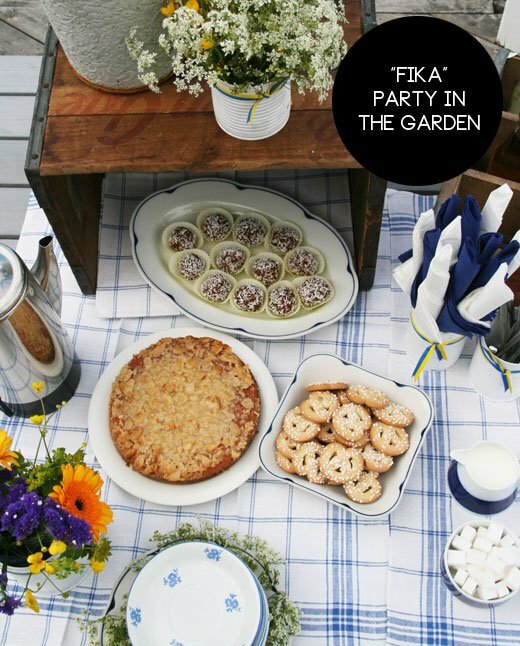 Love this “FIKA” party in the garden – it looks so beautiful and fun! Wow. The food, the decorations, the colors, all look beautiful. This is truly a fete. Thanks for the inspiration!